SDVT Banner Fund is a charitable trust registered with the Charity Commission for England and Wales.Trust Deed dated 22 December 2000. 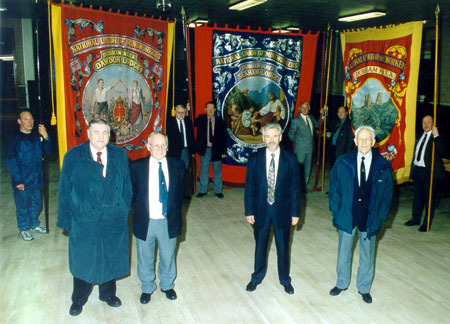 We are NOT just about the renewal and conservation of Seaham's old mining banners from Seaham, Dawdon & Vane Tempest lodges, though that is an important aspect of our aims. "To advance the education of the public, in the County of Durham and the surrounding areas, in matters relating to industrial heritage and history in the mining industry including musical aspects." Though we are based in Seaham and our focus will be on Seaham's collieries, banners and heritage our work will, wherever possible contribute to the wider heritage of County Durham and the surrounding area. Basically, we are a group of people who have between us a good understanding of the mining history and wider heritage of Seaham and the County of Durham. We are are all proud to have in some small way been a part of that heritage and we have an appreciation of the value of our heritage to our community and in particular to our children. The founder Trustees are pictured below but in recent years we have been inviting others to join us as (non-trustee) members. We hope our numbers will continue to grow in this way. We also see our work being enhanced by working with partner groups and this is also an area which is actively being expanded.